The Bombardier CRJ200 GLS is a business jet conversion program for the CRJ200 offered by Maine Aircraft Sales. Conversion of the interior of the CRJ200GLS is completed by Flying Colors Corp. A long range fuel tank system is retrofitted into an existing CRJ200, through a supplemental type certificate (STC), to give the CRJ200 GLS increased range, similar to the Bombardier Challenger 850. The Interior of the CRJ200 GLS is completely redesigned into a business jet interior. Custom interiors can be requested for the Bombardier CRJ200 GLS. Also note that the Bombardier CRJ200 GLS is not actually a Challenger 850, even though it is being marketed as one. Bombardier is the only manufacturer of the true Challenger 850. All CRJ200 GLS are conversions of CRJ200s that were commercial jets. Many of the CRJ200 GLS s are airframes that were built before the Challenger 850 was introduced by Bombardier. 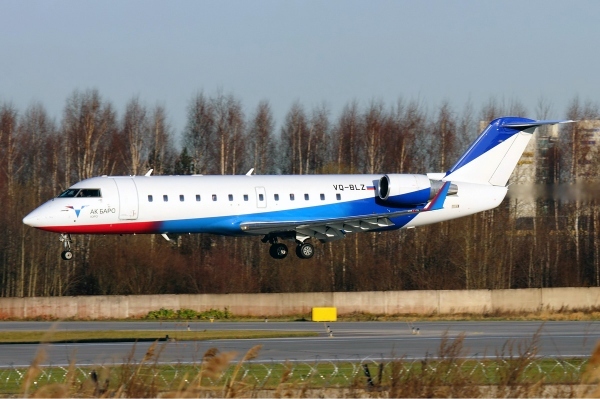 Even though the Bombardier CRJ200GLS is not actually a Challenger 850, it is very similar to it. Range of the CRJ200 GLS is around 3,000 nautical miles. Excluding range, the CRJ200 GLS performance is very similar to the Bombardier CRJ200 LR and the Challenger 850. The CRJ200GLS price is in the range of $12 million to $17 million dollars, according to brochures. Above Bombardier CRJ200 GLS (actualy a CRJ200) photo by Igor Dvurekov on Wikimedia Commons. Photo (only) released under a Creative Commons License. The Bombardier CRJ200 GLS is also referred to as the Bombardier CRJ-200 GLS, Bombardier CRJ 200 GLS, Bombardier CL-65 GLS, Canadair CRJ200 GLS, CRJ200 aircraft GLS and the Bombardier CL-600-2B19 GLS.